Despite their rigid structure, Ancient Greek plays resonate in whatever era they are presented. Gods and demigods dealt with the same jealousy, conflict, passion, and humor mortals encounter in the real world. These powerful emotions are the centerpieces of two festivals: The Third Annual Onassis Festival, “Birds: A Festival Inspired by Aristophanes”, offers Nikos Karathanos’s magical production of the comedy at Brooklyn co-producer St. Anne’s Warehouse, and The Seeing Place Theater’s “Whistleblower Series” at the Lower East Side Paradise Factory features Brandon Walker’s timely and provocative recreation, The People vs. Antigone. “Where are the birds?” Pisthetaerus (Nikos Karathanos) and Euelpides (Aris Servetails) ask each other at the start of play. The two Athenians left their city state in pursuit of the featured creatures to create a more peaceful, perfect world. (The 414 BC premiere took place during The Peloponnesian War between Athens and Sparta.) Yet doing so would upend the so-called natural order. Initially, the Birds won’t have it. They are an understandably angry mob who hate humans who eat, catch, torture and shoot them. Slowly, they learn to trust the two well-meaning bird brains and build Cloudcukooland. Vulgarity, improbability and chaos forms harmony, which attracts and meets with the Gods’ approval. 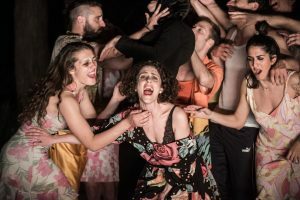 Director Karathanos, choreographer Amalia Bennett (who appears as two birds) and the performers create the antithesis of the traditional collective Chorus. They might move as a unit but among the flock are, to name a few, bluebirds, parrots, cardinals and flamingos attired in color-coded Hawaiian shirts and cruise wear. Angelos Triantafyllou’s score is a lively dance beat replaces the atonal approximation of what the original sounded like. The avian empire is an inclusive one for half-naked males and females, transgenders and non-genders. The golden-haired, ball-gowned Nightingale (Vasiliki Driva) who reminds them of their pride of place in the Universe is a little person. The Gods too are a surprisingly open society. Disclosing the moving deus ex machina would spoil it. This enforced ending can be nonsense. Here it makes beautiful sense. Cloudcukooland and Mount Olympus are two early examples of Cloud City. Gulliver was contained in one. Captain Kirk and Mr. Spock memorably investigated another. Darth Vader used Lando’s to capture Han and give Luke some unwelcome news reminiscent of a Greek myth. At St. Anne’s, it is represented by a hanging a large cumulus cloud shaped out of cotton balls. There is also a large lighted white ball representing the new utopia as an equal playing field uniting performers and audiences. Of course, there is a wall representing several ideas but never outright its current connotation. Those who own up to that idea don’t care about Cloudcukooland, and if they got there, be chased away by angry birds that they won’t find on their phones. Still, it’s not the throne or marriage to the devoted Haemon (Joshua George) Antigone wants: she wants to bury her justifiably rebellious brother Polyneices. He and he fourth sibling Eteocles killed each other vying for the throne. Antigone’s sense of family honor and justice ends tragically for the remainder of this dysfunctional family. While the “People” are represented by Guard Clinton Powell who is both observer and participant, Walker emphasizes that Creon regards the people as a mindless crowd. He “works” only for himself. He refuses to bury his nephew because he fears changing “the law” will make him look weak, which he is already. In halfheartedly trying to pardon Antigone, he and everyone else knows he will punish her to the full extent of that law. Besides, she won’t give in because of her love of family and strong codes of ethics. Antigone, along with the two previous Theban plays Oedipus the King and Oedipus at Colonus, are still culturally relevant enough not to hold surprises for casual theatregoers or students exposed to a thoughtful core curriculum. Yet Walker’s writing and direction is tense. His focus on the minor characters of Ismene and Creon’s wife Eurydice (Isa Goldberg) shifts the focus from fate to family. The cast forms a strong, yet bitterly divided family with Sabrina Schlegel-Mejia as its true head. With a sustained choked sob, she may not have persuaded her extended family but everyone else was on her side. The Birds runs through May 13 at St. Anne’s Warehouse (Brooklyn Bridge Park/45 Water Street). Running time is two hours without intermission. Projected English subtitles provided. A limited number of tickets may become available on the night of each performance. There is an in-person ticket waitlist at the box office one hour prior to showtime. Information on Birds: A Festival Inspired by Aristophanes is located on Onassis Foundation USA website. Events take place around NYC through July 8, 2018. Remaining performances of The People vs. Antigone are on May 10, 11, 12, and 13, 2018 at The Paradise Factory (64 East 4th Street, NYC). Running time is 90 minutes without intermission. The Seeing Place’ Theater’s Whistleblower Series runs through May 13, 2018. Other plays in the festival are I Am My Own Wife and My Name is Rachel Corrie. Further schedule and ticket information are on the company’s website.